This month the Governmental Accounting Standards Board applied new rules for reporting pension debt to retiree heath care. It’s a broader look, shows year-to-year changes, and requires local governments in state systems to report their share of debt. And the new numbers must be reported on the face page of financial documents, not buried deep in the notes of lengthy documents known only to those with green eyeshades. This month also is the end of the first fiscal year for which local governments are required to report their share of pension debt under the new rules. The two big state pension systems, CalPERS and CalSTRS, are helping local governments do the paperwork. 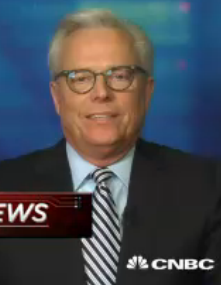 The purpose of the new rules was briefly outlined last week by the accounting board chairman, David Vaudt, in an interview with CNBC about the change for retiree health care, often called in government Other Post-Employment Benefits. “Previously, what happened under current standards is that the pension and OPEB liabilities appeared in the footnotes of the financial statement, and regretfully that didn’t get the attention of the policymakers, the mayors and councils, the governors and the legislators,” Vaudt said. Needless to say, public knowledge of a problem does not necessarily lead to a prompt political solution. The first report of California state worker retiree health care debt, following the earlier GASB directive, was $47.8 billion in 2007. By last year the debt had grown to $72 billion, larger than the $50 billion debt or “unfunded liability” for state worker pensions. State worker retiree health care has been one of the fastest-growing state expenses: $1.9 billion next fiscal year, up fourfold from $458 million in 2001. It’s also one of the most generous benefits, requiring no contribution from most state workers. The subsidy pays 100 percent of the average health care premium for retirees, 90 percent for their dependents. It’s an incentive for early retirement at age 50 or 55, some argue, because the subsidy for active state workers is 80 to 85 percent of the premium. On becoming eligible for Medicare at age 65, retired state workers are expected to enroll and switch to a supplemental state health insurance plan for costs not covered by the federal plan. Last January Gov. Brown proposed a long-term plan to cut costs. State worker retiree health care would be shifted from “pay-as-you-go” funding, which only pays the health insurance premiums each year, to pension-like “prefunding” that invests additional money to earn interest. State workers would contribute half of the normal cost of the plan, work longer to qualify for full retiree health care, receive a subsidy no higher than active workers, have the option of a lower-cost health plan, and face tighter dependent eligibility and Medicare switch reviews. The plan must be bargained with unions. An incentive for unions might be that agreeing to the plan would strengthen the “vested right” to retiree health care, which some think may not have the legal protection currently given to pensions. 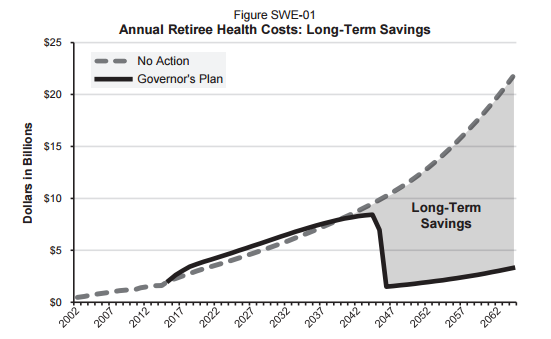 A chart in the governor’s revised budget proposal last month shows retiree health care costs rising for nearly three decades under the plan, as prefunding is added to pay-as-you-go costs, before dropping sharply to yield big savings. One of the big criticisms of public pensions, that investment earnings are too optimistic and conceal massive debt, surfaced in the Legislature in 2006, when the state Senate removed David Crane from the CalSTRS board. For almost a year, Crane had repeatedly questioned whether the CalSTRS earnings forecast was too high. His opponents reportedly said he was undermining support for public pensions, leading to a Senate vote not to confirm his appointment. How important are pension fund earnings? CalSTRS and CalPERS both expect a diversified portfolio of stocks, bonds and other investments to pay about two-thirds of future pension costs, with another third from employer-employee contributions. The current earnings forecast of the two big pension systems is 7.5 percent a year, down from 8 percent a decade ago. What happens when the earnings forecast drops was shown in a well-publicized paper by Stanford graduate students in 2010. Using a risk-free bond rate recommended by some economists for pensions, 4.14 percent, the debt or “unfunded liability” for CalPERS, CalSTRS and UC Retirement ballooned from $55.4 billion to $500 billion. A credit-rating firm, Moody’s, began using a lower earnings forecast for pension debt in 2013. The stricter stance is costing Moody’s business as some cities use other firms to get higher bond ratings, the Wall Street Journal reported this month. The new GASB rules, aiming for middle ground with a “blended” rate, allow a pension fund to use its earnings forecast. But if the projected assets fall short of covering future pension obligations, a lower bond earnings rate must be used for the shortfall. Two years ago CalSTRS feared its debt under the new rules would be the nation’s largest, $167 billion. But last year legislation raised employer-employee contributions $5 billion over seven years, dropping the debt to $58.4 billion. The part of CalSTRS debt school districts and other employers will report is based on their share of total contributions. The districts have the option of using financial data from last fiscal year or waiting until October for data from the current year. The CalPERS debt for non-teaching school employees also will be based on the district’s share of total contributions. CalPERS is preparing accounting valuation reports for its state, local government and school plans, charging $850 or $2,500 per plan. In the early years of California pension funds, there was no controversy over earnings forecast and no ballooning debt. Public pension funds like CalPERS, formed in 1932, were only allowed to invest in bonds with a predictable yield. Then in 1966 voters approved Proposition 1 that allowed up to 25 percent of pension fund investments to be in large-company stock that paid dividends and met other safety tests. Voters rejected a measure in 1982, Proposition 6, that would have allowed 60 percent of pension fund investments to be in stocks. But in 1984 voters approved Proposition 21 allowing any investment that followed the “prudent person” rule. The ballot pamphlet argument for Proposition 21 said pension board trustees would be “personally liable” if they fail to exercise the care of a “prudent person” knowledgeable in investment matters. Now CalPERS and CalSTRS purchase insurance to protect board members from being personally liable for bad investment decisions. There have been no lawsuits or legal claims alleging board members made imprudent decisions.